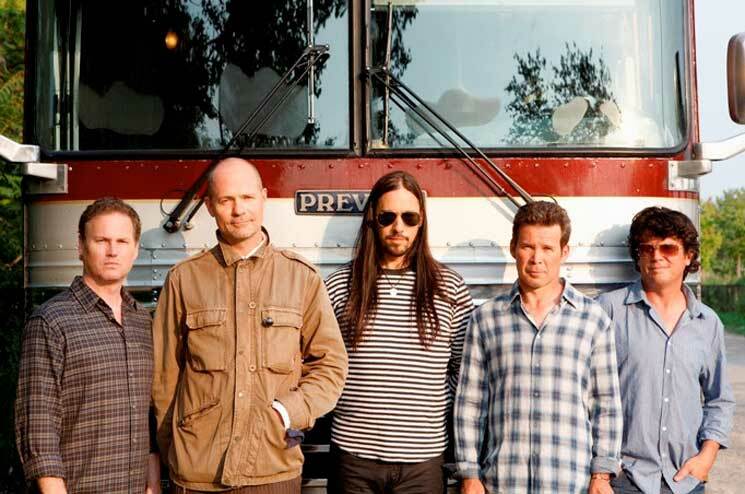 The Tragically Hip put a wrap on their "Man Machine Poem" tour last weekend with a nationally televised performance in their hometown of Kingston, a performance to which no news photographers were granted access. Now, guitarist Rob Baker has weighed in on the decision. Taking to Twitter, Baker said the decision hinged upon "the logistics of space, safety and fairness." Concert promoter Live Nation said the tour's final venue, Kingston's K-Rock Centre, was too small to accommodate the large number of photographers, only able to hold just under 7,000 spectators to begin with. Publications were instead provided with photos by the promoter. "Does anyone feel that there has been a lack of coverage of this? That the public hasn't been served?" Baker tweeted. "Close friends who are photographers, some who have worked with the band for 20+ years were redirected to other shows. Where would the 100+ photographers shoot from? Why [the Canadian Press] and not [the Kingston Whig-Standard]? Access at concerts is always limited — 1st 3 songs only." Naturally, the decision prompted criticism from journalists who expressed concern for being barred from a historic event, to which Baker replied "it's a concert and ultimately between us and the people who have supported us for 30+ years." You can view some of Baker's tweets, as assembled by CBC, below. Writing for TVO.org, CP editor-in-chief Stephen Meurice said it was policy to not use handouts if its journalists are barred from events. "Using handout pictures produced and controlled by a person or organization we cover removes our ability to exercise that editorial independence," he wrote. "The images become, essentially, promotional material, and we do not distribute such material as part of our news file." Canadian publicist Paula Danylevich told the CBC that she was surprised at the reaction, saying that the issue had been blown out of proportion. "As someone who has vetted hundreds of media requests for photo passes for numerous bands over the years, I believe the Hip would have suffered 10 times the backlash if they would have granted access to just one media outlet, or a small handful," she said. "I can tell you it's no easy job to decide who gets approved. You will always piss someone off." For the Hip's final performance, 11.7 million viewers tuned in. Read our Essential Guide to the band's work here.